We see two other important functions, commands "Trim" and "Extend". Let's see how to put them into practice. With the "Line" tool, draw five segments, like those in the following image. Now click on the command "extend" . On the “command line” is written “select objects” and the cross-hairs is changed to a selection handle. Click now on the last vertical line to the right, then click with the right mouse button to confirm this selection. The command line now asks “Select object to extend...”, click on the two horizontal lines above, first one then the other, both will be extended until it meets the vertical line that we had selected. At this point by clicking the right button, we finish and leave the command. In practice at the beginning of the command, AutoCAD asks us on what objects (lines or shapes) we want to extend one or more lines, and once chosen, we choose the lines to extend on them. The condition for this is that the lines, if projected, going to meet the first selected. In the previous picture in fact, the horizontal line at the bottom is impossible to extend, as it would not go to meet the first line we have chosen as the destination. 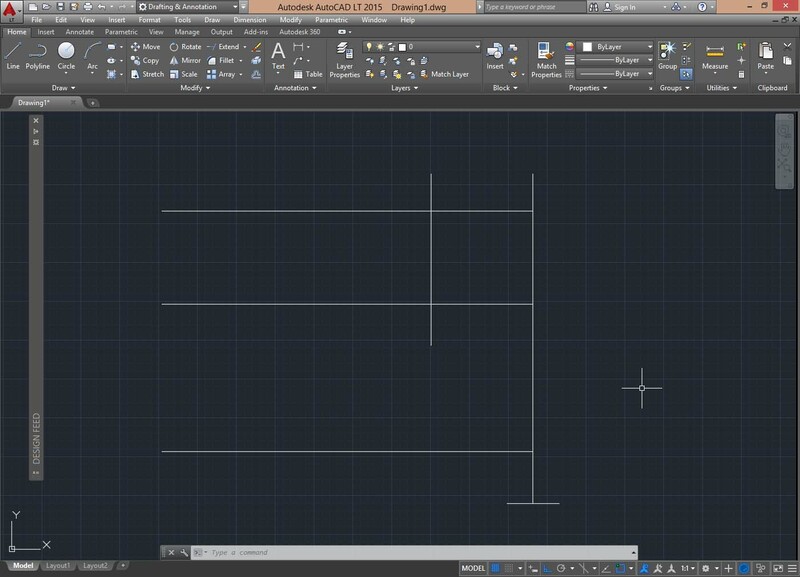 Be careful because is a situation that often happens and in which the neophyte AutoCAD designer is in trouble. It is actually very easy to get out, just draw a temporary line, on which we will extend the first vertical line, so on this then, we can extend the horizontal line that was previously not possible to extend. We could then draw another piece of line, following the first, on which to extend the line down and then delete it. We could also copy (we'll see after the “copy” command) the vertical line above itself, extend this last line on a provisional basis, as in the image above and then delete them. In fact, if we have two overlapping lines, and we do click on it to extend, it extends one, the other remains hidden below. If instead of direct single-click, we select through a selection window, extend both overlapping lines. Continuing from where we are with the extend command, click on the “Trim” tool , select the vertical line on the left, right button to confirm, then click on the horizontal lines on the left of the vertical, the two lines will be cut from the first, now right-click to finish. Press enter, or the right mouse button to resume the command “Trim”, select now the two horizontal lines and also the right vertical, as cutting lines, (try instead to make a selection window that intersects all), right-click, select the outer four segments to be cut so going to form a rectangle. Even for the “Trim” then, you must select the first cutting objects (lines or shapes) and then the lines or geometric shapes to be cut. In this case, it is obvious how these lines should already be intersect with each other because the first can cut the second. Once you click on tool, cut or extend, pressing the right mouse button or the enter key, it means that all lines could be extended or cut each other, depending on the selected command. Draw three vertical lines (they can also be non-parallel) and three horizontal lines that intersect only one of the vertical. (See picture). Now click on the “extend” command and then the right mouse button*, now click on the horizontal lines several times, they will extend the first line on the first meet and then on the second. In doing so pay attention to the fact that if you click on the part left of these lines by their centers, do not extend. It may seem that the command does not work, but it is not. Now using the “trim” in the same way, try to go back to cut the lines that have previously extended, (also try, in addition to select one at a time, to make a box selection that intersects two or three, you can be cut or extended in this way many lines in one pass only). *As you can see, in this way is like chose to cut or to extend all the lines in a single click.